Before purchasing a caravan it is important that you make an informed decision about what you are buying. 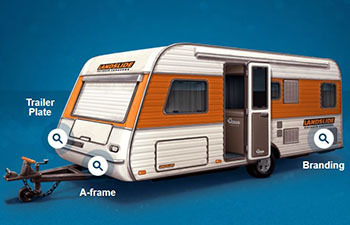 Use the interactive Van Aware tool to identify issues related to a caravan's identity. certification statement for new trailers or imported trailers. no chassis number or VIN number present at all. If you are still unsure then there are further checks available to help confirm that you are not purchasing a stolen or rebirthed caravan. If you’ve completed any of these steps and you still have questions about a caravan you should seek advice from an industry expert. Caravanning Queensland is the peak industry body for caravanning in Queensland, with members located from the Gold Coast through to Cairns, and will be able to organise a safety check of your caravan. Make sure you’re getting what you pay for. Our checklist for identifying re-birthed caravans (PDF, 339KB) will show you what to look out for when inspecting a used caravan.